The Greater Cleveland Film Commission is integral to the growth and progress of Northeast Ohio. You might not feel the excitement of a movie being filmed without seeing a movie truck where you live or work, but you can be sure that your community is impacted. Hotels, restaurants, dry cleaners, lumberyards, printing companies and many other businesses of all types profit, as well as people in your community who may be a set designer, accountant, insurance broker, actor, actress or other production professional of some kind. 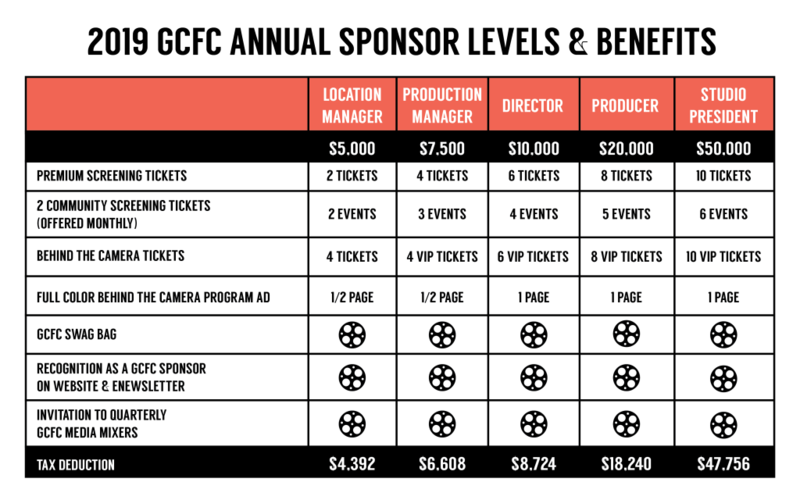 GCFC does not receive any funds from the media productions we work to attract here. We rely solely on contributions to advance our mission. We have the support of Tom Hanks and the Russo Brothers, now we need you! We can’t do it alone. We need to have the support of the businesses, foundations and institutions that are the engine that powers this region. By becoming a sponsor, you are making a statement that your organization is invested in the growth of this new industry that is part of the ongoing renaissance of Northeast Ohio. Let’s add to the list of projects that have filmed here like, “The Fate of the Furious”, “Captain America: The Winter Soldier”, “Little Evil”, “The Bye Bye Man” and “Draft Day”. In return for helping us bring jobs and economic opportunity to Northeast Ohio, you’ll receive exclusive opportunities for events like movie screenings, wrap parties, and tickets to our annual “Behind The Camera” fundraiser. Thank you for doing your part! For questions, please contact Seema Jayaswal at 216-344-7476 or [email protected]. Click HERE to become a GCFC Sponsor! GCFC Annual Sponsorships are valid for one year from the date of purchase. GCFC Annual Sponsorships are tax-deductible to the maximum amount allowed by law. GCFC Annual Sponsors will be listed in all donor recognition listings unless requested to remain anonymous. GCFC Swag Bag items available upon initial sign-up for sponsorship. Community Screenings are offered monthly and in partnership with Allied Global Marketing and The Owens Group. The designated contact person for the annual sponsorship will receive at least two email notifications during the month announcing the screenings available that month. Quantity of tickets is determined by sponsor level. PLEASE NOTE: All screenings and fundraising events are subject to change without notice.